English - ""Casa da Boavista"- Alojamento Local- registo 30897/AL Turismo de Portugal I.P"
Dear Friends, welcome to this site, I hope you enjoy the house and the region. This is a Portuguese Site but you will find some information about the house and region here below. In order to see the availability, bookings and contact please click on "Reservas"
For surrounding photos click on "A região" page and its subpages . To see the map click on "home"
From June to September clients are required to arrive and leave the property on Saturdays only. There is a booking fee of 50%. Bedding : 3 Double bed, 2 Sofabed. Garage, Private parking lot, children's playground, Charcoal barbecue. If you want a place to relax, here you are sure to find peace . The house is new , has all the elements of comfort, and is located in a beautiful , happily unknown place of mass tourism . 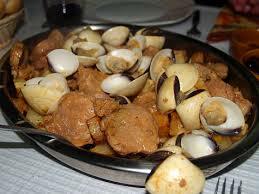 The house is located in the region of Alto Alentejo , near the Tagus River and the historic Belver . It is perched on the highest part of an adorable, quiet village where you have a breathtaking view . Outside you can enjoy several areas: 2 awnings ( one of them with barbecue ), swimming pool , terrace , playground and fenced around the house ground. Garage and private parking . The "casa da Boavista " is an isolated villa with all the comforts , fully furnished, with three doubles and also a sofa bed in the living room. You do not need to bring anything as linen , towels and kitchen utensils are provided. The kitchen is fully equipped and has , among others, dishwasher, washing machine, toaster and coffee machine. The living room is spacious and includes stereo, TV , DVD , satellite dish and a salamander high efficiency. The Northern Alentejo is an almost mythical region, a region where time is time and space is space. Reality lies here, waiting to be unveiled, in the endless plains and mountains, in the water that entertains and cures, in the great open spaces in the midst of nature or in those built by man both for ancient wars and for peace. Authenticity lies here, in the nobility that our forbear's lent to the stones of the dolmens and menhirs, to the armorial bearing of the manor houses and to the unique flavours generated in secret in the ancient convents and wineries. The truth also lies here, in the festival and the fair, in the music, the dancing, and in the local art, where tradition is maintained. One is first taken by surprise by the remarkable traces of successive cultures: dolmens and cromlechs, Roman and Arab vestiges mingling with the most recent sign of Christianity of which the numerous medieval castles (like Belver castle less than 2 km's away) are but one example. 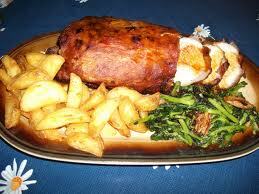 In this region, the cuisine is also particularly varied and flavourful. 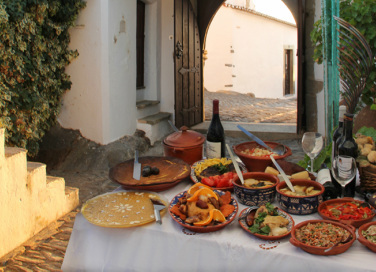 You can choose to try the stewed eels, the shad soup or the Tagus lamprey, the sausages or the kid stews, the hare with the red beans and the fried rabbit with Alentejo olive oil. Do try the delicious regional bread, that you can add to the sheep and goat cheeses. In this region you will also find an enormous variety of cakes and pastries, such as the "celestes", the "palha", the "imperial" cakes, those from Évora baked with eggs and almond paste, and the convent pastries. 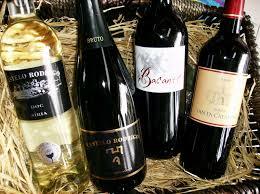 Try also the Gavião wines and those from Almeirim, Borba, Reguengos and Vidígueira.